Chocolate Covered Strawberries are a favorite treat to make. Why not make some for your special Valentine? 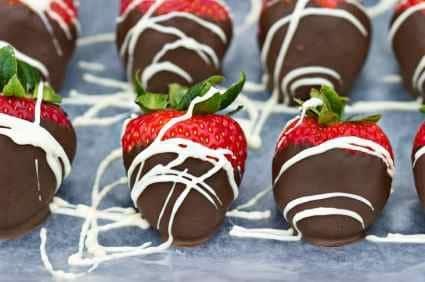 You can make these chocolate covered strawberries easily at home, these would be the perfect gift for the ones you love. Now, there are two ways you can prepare these chocolate dipped strawberries, if you have never dipped with chocolate before, you may want do try to use “dipping chocolate“. This is easy to use, simply heat, and dip. Now, if you really enjoy chocolate, I would suggest you purchase chocolate chips or even higher end chocolate, but you will need to temper this chocolate, this isn’t hard to do, but it does take an extra step or two. Wash your strawberries and pat dry with paper towels. Failure to start with completely dry strawberries will ruin the chocolate, you will end up with useless chocolate if water gets into the chocolate. Melt chocolate by placing in a microwave safe bowl, melt chocolate chips on the defrost setting or the lowest power setting available. Heat in 30-second increments stirring each time, and heating until the chocolate is completely melted, add in softened butter and stir well to blend well. The butter will help the chocolate have a nice soft texture. Now its time to dip the dry strawberries. Grasp the strawberry by the green top, roll the strawberry into the chocolate, and give it a little shake when you pull the strawberry out of the chocolate, this will fill in any cracks that there might be. Point the strawberry upward, and allow the chocolate to cover most of the strawberry. If you want to decorate with sprinkles or nuts, sprinkle the strawberry now, while the chocolate is still soft. Place dipped strawberry on waxed paper. My strawberries were drizzled with a little white chocolate to make them extra pretty. Store these dipped strawberries in the refrigerator. Want to know more about chocolate? Check out Candyland and Crafts page about What is Chocolate. Yield: varies.